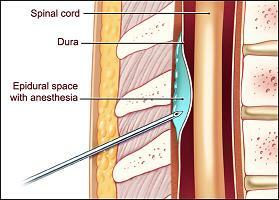 Epidural anesthesia is accomplished in much the same technical manner as spinal anesthetics. The positioning of the body, technique, injection sites and general results are all very similar. The most common position for performing an epidural anesthetic is with the patient in a sitting position, leaning asa far forward as comfortably possibl;e, with their back "humped" out toward the anesthesia provider, in a "mad cat" appearance. Unlike spinal anesthetics where, once the medication gradually wears off, an epidural anesthetic can be a "one-shot deal", or a more controlled, sustained anesthesia that can be re-dosed through a small catheter that is inserted into a space just outside the spinal sac called the epidural space. There, the anesthetic mixture coats and bathes the spinal nerves, is absorbed and exerts it numbing action. With the catheter in place, ther is now a portal through whic the anesthesia p[rovider can inject additional anesthetic agents, or pain medication post procedures. The presence of the epidural catheter allows for multiple doses of anesthetic for situations such as lengthy surgical procedures. One very common and popular use is for labor and delivery. Another sommon use is pain reliefe after major joint replacement surgery. The anesthesia provider, or Pharmacy provider can an arrange for either anesthetic agents or narcotic pain medication to be injected through the catheter into the epidural space, providing effective pain control. Dosages are carefully adjusted for strength and frequency to ensure safety. One thing to note is that epidural anesthetics typically take longer to fully work that its spinal counterpart and certain areas such as the ankle and foot are less likely to receive optimal anesthesia levels than spinal anesthetics deliver. Consequently, many care givers opt for spinal anesthetics with narcotics mixed into the solution because of the more rapid onset of effect, and increasingly shorter surgical times. After surgery, these catheters can be easily converted to perform pain control functions by being connected to a PCA (patient-controlled analgesia) pump where doses of narcotic pain medication can be administered at pre-determined time intervals automatically, with the additional ability of patients being able to press a button to receive a minimal “bolus” or boost of medication when needed.